The Thrifty Gypsy's Travels : How To Get Kicked Out of the Vatican! 1. Bring your multi-tool, kitchen scissors, pepper spray, or your spray paint! I know you think it'd be funny to show off your Swiss Army knife to the Swiss guards, but I'm sure that joke has lost its touch on them by now. Attempting to bring a weapon of any type into the Vatican is strictly prohibited and doing so could win you a free trip to the Vatican jail. Now that would be an interesting stamp in your passport! But if you forgot to pack the machete in your luggage, proceed to step two. 2. Wear your best street-walking outfit. That's right, ladies; if you got it, flaunt it. Work what your Maker gave you! Bare those shoulders and show off those upper thighs. You might get a few glances before you're given directions to the red-light district. And don't think you're off the hook, gentlemen. Wearing a t-shirt with "F--- You" written on it might give you street cred, but it's not going to fly when it comes to the Vatican. 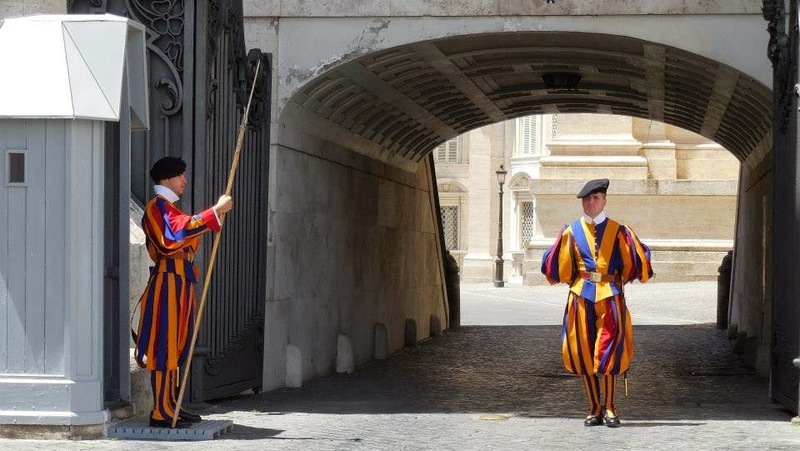 The Swiss Guards will be eager to give you a finger of their own... as they point the way to the door. Oh, and they don't perform their wardrobe checks until after you've stood in line for security, so the last laugh is theirs, bro! But if you're fresh out of inappropriate or profane clothing, never fear - there's still one more way you could get yourself kicked out. Proceed to step three. 3. Break out into a raucous rendition of "Wrecking Ball" accompanied by your best imitation of the music video. Preferably stage yourself right in front of the high altar for full blasphemous effect. Or if you're not into Miley, I'm sure Beyonce, Katy Perry, and Eminem would be equally inappropriate as disruptions are sure to give you a fast-track ticket for eviction. I'm sure they wouldn't frown upon a good Gregorian chant or a recitation of the Lord's Prayer, but if you can't remember any of the Latin you learned in middle school, just start humming sanctimoniously. Bonus Tip: How to Anger Your Fellow Tourists! Cut in line! 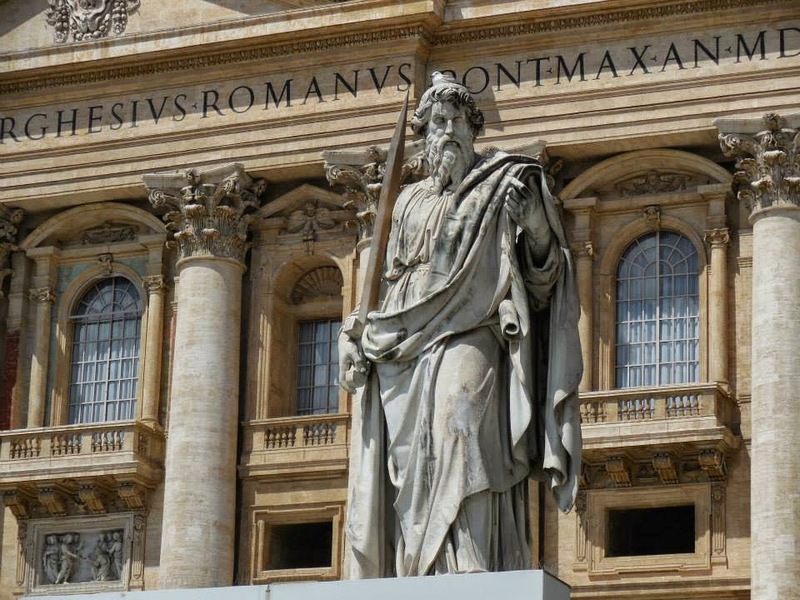 Yes, that's right - if you're looking to anger, infuriate, aggravate, provoke and enrage your otherwise civilized fellow tourist, just stand to the inside of the line waiting to get into the Basilica as you pose for a photo with St Peter's behind you. Then just keep inching towards the line and act as if you'd been there the whole time. Line cutting is the perfect behavior for visiting the capitol of the largest Christian organization in the world! Oh, and to absolve yourself from any misplaced guilt you may have about not waiting your turn at the back of the line, pretend you don't understand any of the muttered complaints uttered in every language known to man by the people you just gypped. Just act like you only understand Klingon, smile banally, and go on with your line-cutting ways. Have you ever witnessed inappropriate behavior like this? *In case you aren't familiar with my humor (you should see what I wrote about Italy's Public Transportation System! ), this is a very tongue-in-cheek approach to describe our visit to the Vatican. These things did and do happen to varying degrees. However, we had an absolute blast at the Vatican, and a more upbeat and "serious" post about our visit will hit the blogosphere in the future! We did the third one but just bought a scarf to cover the shoulders up. Yeah, I saw a lot of people with scarves, which is perfectly appropriate! It was really hot outside, so I know it wasn't fun to wander around in the heat with longer than usual clothing, but I still couldn't believe how many people tried to get in with mini-skirts and tube tops. And then a few of them refused to wear scarves and left instead! When my friend went with her husband, son and daughter the son's shorts were not approved of. So half the family went in and when they came out father and son, who was then about 17, disappeared into a toilet cubicle and changed clothes. It was recognised that this could also look like quite reprehensible behaviour. She's quite sensible normally! My husband wore long trousers that day just to be safe, but we were surprised to see how many men they allowed in with baggy shorts. Then later some people were refused, so I guess it depends on how picky the guards are when you come through. Was it on a Wednesday? Apparently the Pope gives a mass in the square on Wednesdays, except for July and August when he's not in Rome. I've heard it's an incredible experience, but of course you have twice the crowds! Love this! Saw your post on the #SundayTraveler and it definitely caught my attention :) These will definitely ensure you will not be seeing the vatican! :) You're right about that! I would highly amused to see these kinds of people getting themselves thrown out - and now I kind of wish more tourist attractions had the Swiss Guard around. Haha! It seems that the Italians in general are much more strict when it comes to the attire one attempts to wear into their churches. I'm embarrassed to admit that I did not dress very well when I visited St Vitus Cathedral in Prague, but the Czechs didn't enforce a dress code at all. Some people have such little common sense!! How terrible is it to try to cut in line for the Vatican!! Yeah, that really bugged me. It was a long line (it wrapped all the way around St Peter's Square), but it actually moved really quickly. We thought it'd take 2 hours just standing in line; 45 minutes later, we were inside, though. Some people are just rude in general and don't want to wait. :) I figured writing humorously about this would be a better approach than ranting and raving about inconsiderate and clueless tourists, haha. You are hilarious. I wore pants (actually jeans which were ridiculously hot in the unairconditioned Vatican museum) but was surprised that other visitors wearing long shorts were permitted to enter. Wish I had known that I could get away with showing a teeny bit more skin. I want to know who was doing the inappropriate dancing and, more importantly, why. A couple giggling teenagers were the miscreants on our visit. Granted, they weren't dancing as flashily as Miley in the gif I used, but I was astonished that they'd even be cheeky enough to dance even a little. Wow I had no idea that they so strictly enforced a dress code there! Italians are very serious about their churches! I don't know for sure, but I would venture to guess that a greater percentage of Italians are active attendants at church versus the more northern European countries. Same strict rules here in Asia in order to enter temples and shrines. So I always have a thin long skirt and a t-shirt with long arms in my handbag when sightseeing in case it is needed :). But you are right, it is really annoying that some people get in wearing shorts and singlets. It's good to be prepared for dress codes when traveling. It'd be a shame to miss out on a "must see" sight because you're not dressed properly! This made me laugh! Inappropriate behaviour is sadly all too common, especially (I find) in places of worship - but the rules aren't always clear either! Would have thought not taking an army knife into the Vatican would be obvious, though, but apparently not! Good point about the rules not being clear! Thankfully the Vatican is quite clear. As you approach the metal detectors, there are airport-like signs indicating what is not permitted. I saw quite a few nail scissors getting thrown away in the trash cans! "I know you think it'd be funny to show off your Swiss Army knife to the Swiss guards" Haha LOVE this! It's shocking how many people fail to do any kind of simple research before going to the Vatican. No kidding! Or other sites really. While serendipitous travel has its appeal, if you know it's pretty much you're one and only chance of seeing a site, it's best to do your research to make sure you won't be turned away! Hi it's Christa, host of the Sunday Traveler, I just wanted to pop in and say thanks for joining in on the fun! Getting kicked out of the Vatican would def cross something off my to do list ;) . It really is surprising how common sense has failed many people. No kidding! 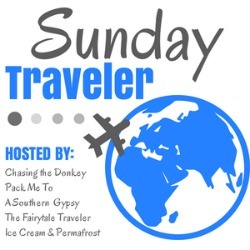 And thank you, as always, for hosting the Sunday Traveler!